Helen and Sam Walton worked to improve the lives of others and that spirit of giving continues today through their grandchildren and nieces and nephews, Kyle Peterson, executive director of the Walton Family Foundation told a crowd of 250 at the 13th annual Single Parent Scholarship Fund of Benton County (SPSFBC) Corporate Luncheon on Tuesday (May 1). Peterson told the story of how Marjorie Wolfe, founder of the SPSFBC, visited with Walton 30 years ago at home in Bentonville with Walton’s grandchildren playing around them. That day Wolfe shared with Walton the struggle single parents have as they try to balance finances, work and raise children while going to college. She left that day with a commitment of $10,000 from Walton to help with administrative costs in setting up a scholarship fund. Not only did she write a check, but Walton also came to the annual luncheons, even as her health declined. She also wrote personal congratulatory letters to the scholarship recipients, until her death in 2007. A year and a half ago, when Peterson joined the organization, he led it to write a mission statement, which had never been done. That mission, to address social and environmental problems in order to “create access and opportunity for people and communities,” is the same mission of the SPSFBC, he said. That mission is also reflected in the other work the Foundation does in Northwest Arkansas and beyond. Peterson said it’s evident in the miles of bike paths in the area and in Crystal Bridges, the world class art museum that Alice Walton brought to the area. (from left) Kyle Peterson, executive director of the Walton Family Foundation; Keri Ledbetter, past scholarship recipient and grants administrator for the Walton Family Foundation; emcee Yuna Lee; and Jack Eaton, executive director of the SPSFBC. “She (Walton) felt everyone should have access to great art, should have the opportunity to actually see it and sample it, not just the people that lived in big cities or lived on the coast,” Peterson said. The Foundation is also actively working in education across the country in cities like Washington, D.C.; New Orleans; Indianapolis; Los Angeles and San Antonio. “We’re very involved in helping to build vibrant schools across the country, because we believe that your zip code should not determine the education you get,” he said. “So together the Walton Family Foundation and the scholarship fund have been sowing seeds and scattering opportunity for 30 years. The impact has been profound,” he said. In addition to Peterson, Keri Ledbetter, a single parent scholarship fund recipient, spoke at the luncheon. She told her story of growing up in an abusive home and becoming a single parent of two children while she was in high school. With the help of the SPSFBC she graduated from NWACC with distinction and then earned a bachelor’s degree from John Brown University in organizational management. She works as a grants administrator at the Walton Family Foundation. Jack Eaton, SPSFBC executive director, said most of the recipient families are living at poverty level with an annual income of $10,000 when the parent enters the program. However, upon graduation, the parent takes a job earning an average of $40,000 a year. “All 31 of our 2016 graduates are out of poverty and off of government assistance and other community resources,” Eaton said. Over the last 34 years the organization has given out more than 8,000 scholarships in Benton County, totaling over $7 million. The Walton Family Foundation underwrites all administrative costs for the SPSFBC and so all donations go directly to student programs and scholarships. SPSFBC’s stated mission is to enable single parents to attain self-sufficiency through post-secondary education. In addition to providing tuition, recipients also can get help with rent, utilities, transportation, counseling and other critical needs. New applicants are currently being interviewed for the 2018 fall semester and can apply at the organization’s website. 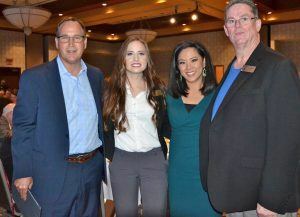 Walmart/Sam’s Club, Colgate-Palmolive, Greenwood Gearhart, Inc. and the Bank of Arkansas were some of the main sponsors of the luncheon. View the printed article HERE. May 31, 2015 – Northwest Arkansas Democrat Gazette – SPSFBC Recipient receives P.E.O. PCE grant.